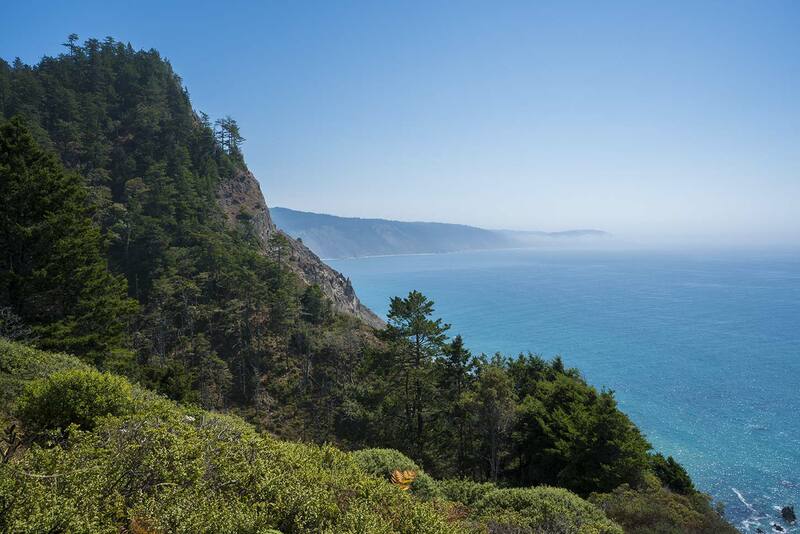 Even by North Coast standards, Sinkyone Wilderness is strikingly wild and isolated, so much so that just getting there is something of an ordeal. 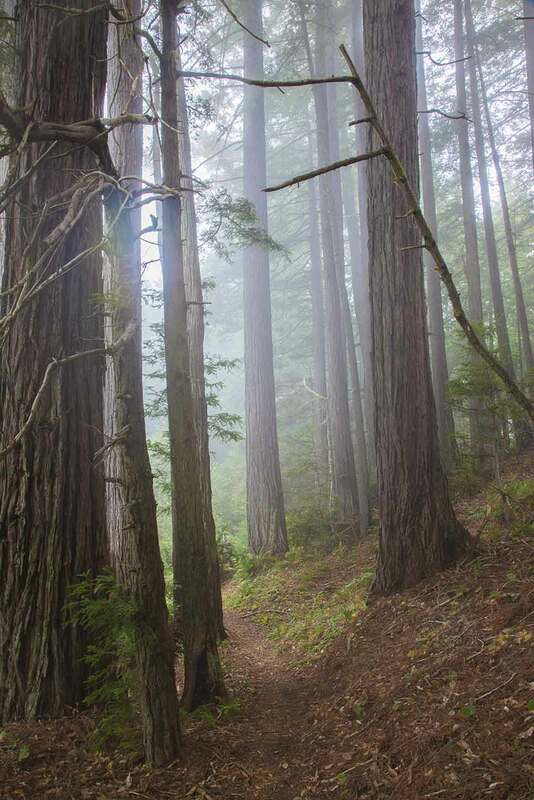 The park offers a pure hiking experience; there’s no traffic noise or other signs of civilization, and there are hadly even any trail intersections, just a singletrack trail winding atop high coastal bluffs for miles. Sinkyone isn’t really a redwood park; it doesn’t have any monster redwoods or cathedral-like flats. 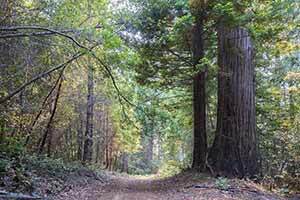 The park does have three named old-growth redwood groves which have a certain intrigue due to their remote location, but the trail only briefly skirts two of the groves, and the redwoods that can be seen from the trail aren’t generally that big. 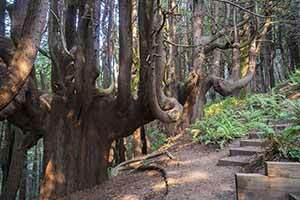 There are also smaller redwoods scattered throughout the rest of the Lost Coast Trail. Also, the park has a long and rugged coastline but don’t expect to find miles of beaches like in other coastal parks; there are just a few coves. The only way to reach the northern trailhead is a 6-mile, one-lane dirt road that descends steeply from a high coastal ridge through lush woodlands. 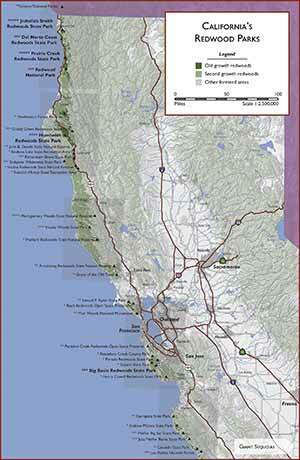 The southern trailhead is reached by a very similar 6-mile dirt road from Highway 1. Although it’s a slow and bumpy drive, if it’s not muddy either road can be driven in regular cars — in summer the worst part of the drive is trying to pass cars going the other way, especially cars towing trailers with boats and 4-wheelers. In winter the road can become blocked by fallen trees or mudslides, stranding park visitors for days. 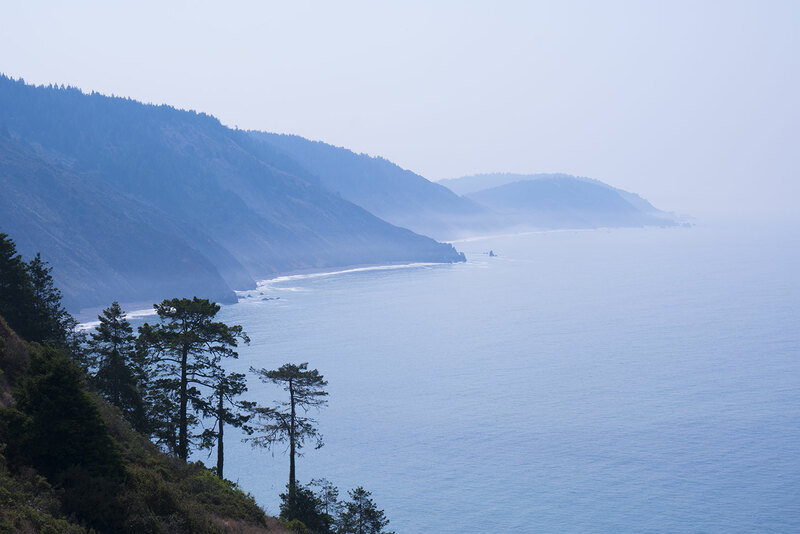 The main trail through the park is the alluring Lost Coast Trail, a true wilderness trail that winds along the rugged coastline for 18.4 miles of punishing ups and downs. A lot of visitors underestimate how difficult the trail can be, especially south of Wheeler, where much of the trail is unpleasantly steep, brushy, and heavily eroded, making it very slow going. On the other hand, it’s also the most scenic part of the trail. North of Wheeler Beach the trail is much easier, although still rough, narrow, and overgrown. The park’s other trails are mostly uninteresting old logging roads. Usal Road connects the park’s northern and southern ends; in summer this rough dirt road can be driven in normal passenger cars, although it’s a really long and bumpy trip. It’s closed in winter. 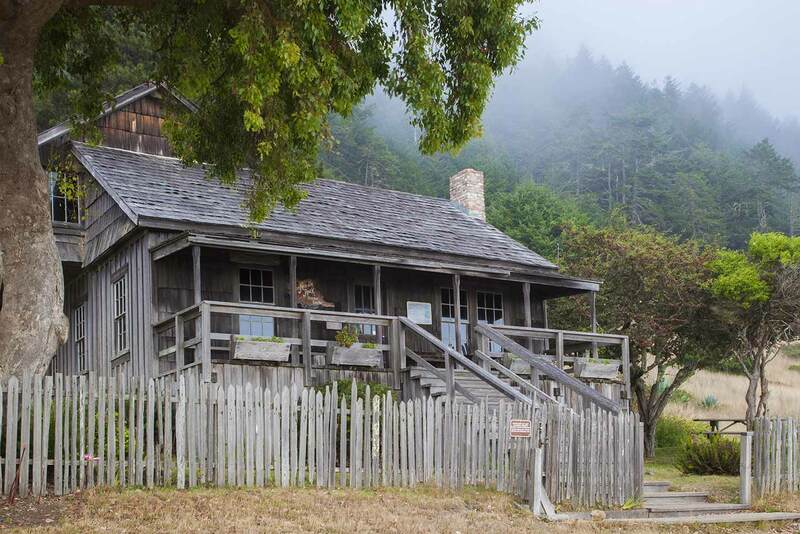 You can’t make reservations for any of Sinkyone’s campgrounds; just pay the fees at Needle Rock Visitor Center or fill out one of those little envelopes at Usal Beach Campground’s unattended “iron ranger” . 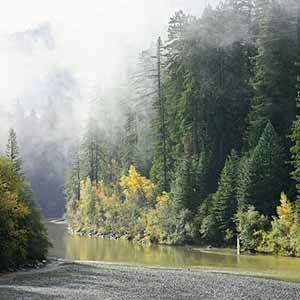 Sinkyone Wilderness State Park has three remnant groves of old-growth redwoods. The groves are small and the trees within them aren’t especially large, but they still make the park a lot more interesting. 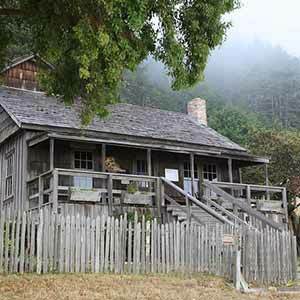 Two of the groves, Chase Grove and School Marm Grove, can be seen on the Bear Harbor to Wheeler segment of the Lost Coast Trail. 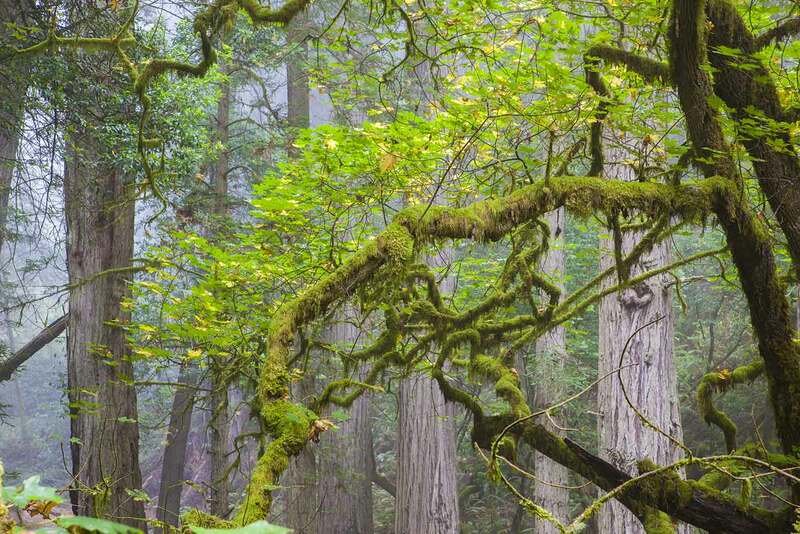 The third grove, the Sally Bell Grove, is historically important since it was one of the last significant stands of old-growth redwoods to be saved from logging. Unfortunately this grove is off-trail and very little of it can be seen. Little Jackass Creek camp has a few old-growth redwoods that might be the very bottom end of the grove. Meanwhile, the Wheeler Trail passes by the upper edge of the grove, but one medium-sized redwood by the side of the trail and perhaps three or four more further back in the woods is all that’s visible. 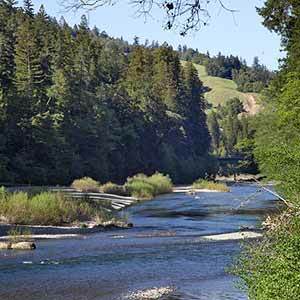 At the south end of the park, the beginning of the Hotel Gulch Trail is densely wooded with redwoods. 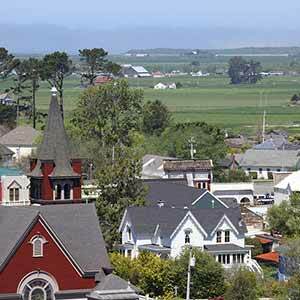 Although it’s second-growth, the gulch is quite attractive and it’s a short, easy walk from Usal Beach Campground. 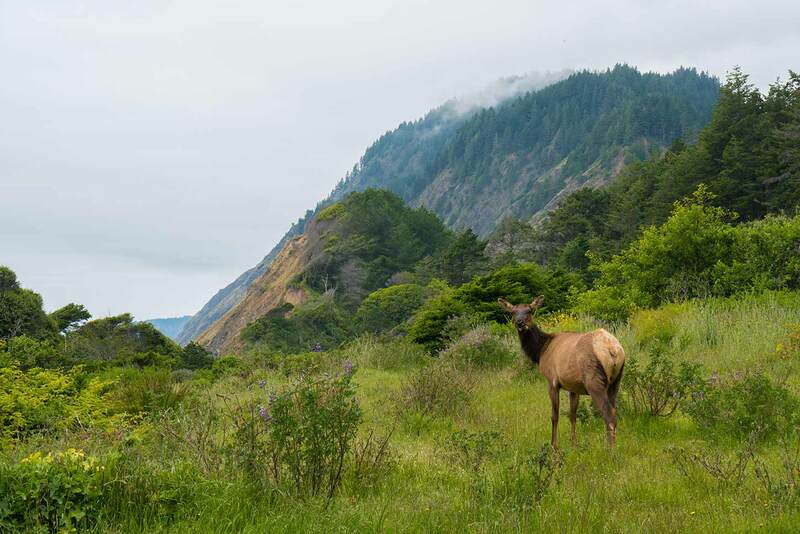 The challenging and remote Lost Coast Trail runs over high coastal bluffs and through deep canyons, with a few old-growth redwoods and black-sand beaches along the way. Shady Dell, which is at the southern end of the Sinkyone Wilderness right next to Usal Campground, features a small but rather bizarre-looking hillside grove with impressively reiterated old-growth redwoods. The little-used Wheeler Trail is an old logging road thet descends past the Sally Bell Grove to Wheeler Camp.